The French motorways have been blocked by demonstrators delaying deliveries. In Spain, there is currently a predominance of small sizes and the rising competition from Turkey is taking a toll. For their part, Turkish exporters are unhappy after a disappointing start to the season. In the US, the picture is different and the three most important growing areas in California are on the market. The conditions are perhaps not ideal, but nobody is complaining. Although lemons are not in the ranking of Israel's main export products, a large volume is grown for the domestic market. A total of 64,500 tons of lemons are expected to be harvested this year; of these, 60,000 tons will be sold on the domestic market and about 4,000 tons are intended for the processing industry. The remaining 500 tons are exported. "We see a slight increase in the production every year," says an exporter. This is putting pressure on the price. The list of export destinations includes France, Germany, Italy, Russia, the United Kingdom and Japan. "Our greatest challenge for the coming months is to export to distant destinations, where there are opportunities," says an exporter. The lemon market is competitive for Israeli growers. Since the fruit's harvest takes place several times a year, there are competitors in both the northern and southern hemispheres. "As a result, we are more affected by competition than Spain or Italy." We also face competition from South Africa or Argentina. "Israel may be in luck, since Spain and Mexico have had problems with the fruit's sizes. On August 20, the season kicked off with the Meyer lemons, which reached a good price. In mid-September, prices began to fall "as a result of smaller sizes and bad marketing," as stated by an exporter. Competition between Turkish exporters was fierce. A month after the Meyer's arrival, the season kicked off for the Enterdonat, which was in a similar situation. The start was marked by good prices, but a downward trend was soon observed. Also, the exchange rate is taking a toll on the exporters. Due to a fall in the exchange rate with the dollar and the Euro, exporters saw part of their profits suddenly disappear. "It is the worst season ever," complains an exporter. "The season is ruined, so I expect more bad times in the coming months." Exports mainly target Europe, but next year, the Far East and Arab countries will also be considered. Turkish lemons are usually cheaper than the Spanish and according to a Turkish exporter, there is hardly any competition. At the moment, the price for the Meyer, whose season will come to an end in the coming weeks, oscillates between 0.28 and 0.38 Euro, depending on the quality and size. The price for the Lamas is not yet clear, with some believing that Europe could put some pressure on it, although this is uncertain. The market is now preparing for the Christmas season. For the Primofiori, the campaign started without big surprises, marked by the mild springy weather, problems with the fruit sizes and the competition from Turkey. In Murcia, the season started more than two weeks later than normal, because the fruit still had to reach the right size. There is a large availability of small calibers, although the rain could still cause the calibres to grow later in the season. In the first weeks of the campaign, the sector struggled to meet the demand because hardly any lemons with the right size were available. In the weeks that followed, many European supermarket chains had to adjust their size requirements and accept smaller lemons, a few millimeters under the standard. The most inflexible chains therefore had to deal with a smaller supply. According to one exporter, the race is not yet over and the situation could still improve, since it has rained a lot in the growing areas lately. Halfway through December, the bulk of the harvest is expected to reach better sizes. Competition with Turkey was fiercer around the start of the Spanish season, despite the fact that the campaigns don't fully overlap. The Turkish exporters have a large volume available this year. Also, it took longer for the last overseas lemons (from Argentina and South Africa) to be out of the market. Although the season started with normal prices, the coming weeks will be crucial. An exporter warns against Turkish competition. The country has a larger harvest and could put the lemons on the market at an aggressive price. In the northern hemisphere, Italy started the lemon season a few days later than usual, in early November, as a result of the dry weather recorded this summer, which delayed the bloom. A smaller volume than in 2017 is expected, but there should still be sufficient fruit to meet the domestic and international demand. In Sicily, the acreage is growing with new plantings that will come into production in the coming years. The quality of the lemons looks better than last year. There are now major difficulties in France, with strikes and roadblocks organized by the Les Gilets Jaunes movement (the Yellow Vests). This is making it tougher to deliver fruit and vegetables to their destinations, including lemons. Stores are faced with shortages, while the stocks of growers and transport companies accumulate. Due to the delays, the quality of the products deteriorates and the prices fall. Spanish products are among the most affected. Last week, there had already been a shortage of Spanish lemons on the market due to the impact of rainfall. The sizes range from small to medium. According to a trader, the demand for lemons is good, although the prices fall regularly. There is a large supply of lemons because the fruit is being harvested in District 1 (Central Valley) and District 3 (Desert region). The harvest in District 1 started slightly earlier than normal as a result of the warm autumn. District 2 (the coastal region) also has some production, although the harvest there has yet to reach its peak. Moreover, the latest import lemons are still available, so the export opportunities are limited. 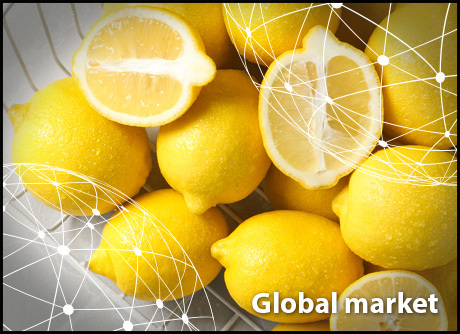 According to reports, the volume of lemons from the southern hemisphere in Japan is declining, creating opportunities for US exporters. This year, there is a larger production of medium sizes than last year, but in general, there is a sufficient supply of all sizes. Lemons are available year-round. In the figures supplied by Hort Innovation, lemons and limes are thrown in together, even though 76% of the volume corresponds to lemons. The total figure is 41,436 tons. Lemon cultivation is still expanding, also because new growers are planting more lemon trees. The imported volume of lemons and limes has increased by 21%, reaching 7,812 tons. The supermarket chain Coles stopped selling imported lemons earlier this year. A grower recently called on his colleagues to think about the long-term and to develop their export opportunities. For now, 4% of the harvest is exported and another 9% is delivered to the processing industry. That means that 87% of the harvest is brought on the domestic market. According to a grower, there are opportunities for export to China, Indonesia, Japan, Canada and the US. Hong Kong and Singapore are also mentioned as easily accessible countries. As for Indonesia, it is argued that its quotas make it a more inaccessible market. The country closed the lemon season at the end of October. This year, exports amounted to 87,909 tons, which entails an increase compared to previous years. The vast majority (63.6%) is shipped to the US. The season runs from May to November. In those months, the varieties Génova, Eureka, Fino and Mesina are marketed. In the summer months, the country launched a campaign in Japan to promote the health benefits of the fruit. In terms of volume, the season that ended a few months ago was similar to those of previous years. Because of the weather, it was an uncertain season. A warm autumn was followed by a lot of rain and frost in the growing areas. No damages were reported, but the harvesting process was delayed. Due to phytosanitary issues, exporters chose to export more lemons to non-EU countries. Russia received considerably greater volumes of this citrus. Argentinian exporters consider it important to find new destinations, partly because the competition from South Africa is increasingly tougher. This year, Chile and Colombia were added to the list, and exports to Japan were also resumed. Moreover, exporters are trying to strengthen their presence in the US market.